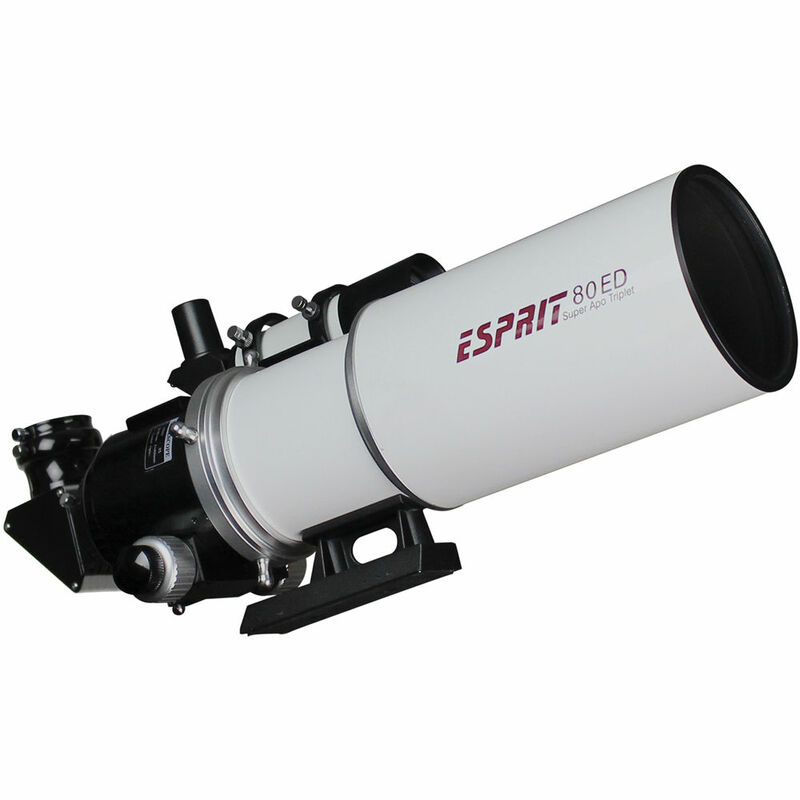 The Esprit ED APO 80mm Telescope from Sky-Watcher is a 3-element refractor telescope designed for astrophotographers. The optical system features apochromatic extra-low dispersion (ED) glass and fully multicoated optics. A 2-element threaded field-flattener corrects distortion that can occur at the edges of the field of view. This combination makes astrophotographic images clear and sharp, with high-contrast and true-color transmission, from one edge of the field of view to the other. With a focal ratio of f/5, this fast telescope is well-suited for astrophotography. The 2" rack-and-pinion Helinear Track focusing system allows you to bring celestial objects into precise focus with virtually no shift. The focuser features tracks above and below the focus tube. This gives the mechanism two points of contact, keeping focuser level even with a camera mounted on it. The Esprit comes with a 90° star diagonal with dielectric coatings. These coatings provide better than 99% light reflection. The telescope also comes with a 8x50 right-angle erector finderscope, a Cannon 48mm T-Ring photo adapter, and a foam-lined aluminum case. Box Dimensions (LxWxH) 26.4 x 19.9 x 15.5"
I have a approximately 2003 version of the Celestron CGE 1100 with computerized mount. Will the Esprit 80 mm scope fit onto this mount? Just read this question and answer a minute ago. Unfortunately, the answer given was wrong, you can use an older cge 1100 mount, I think the person who gave the answer thought it was a CPC1100 which will not work since its a fork style mount. The CGE however has a Losmandy saddle which would work for the Esprit OTA.